The tide and swell were so high they picked up this large freezer from the back of Cargos fish shop and washed it this far over the sea wall. 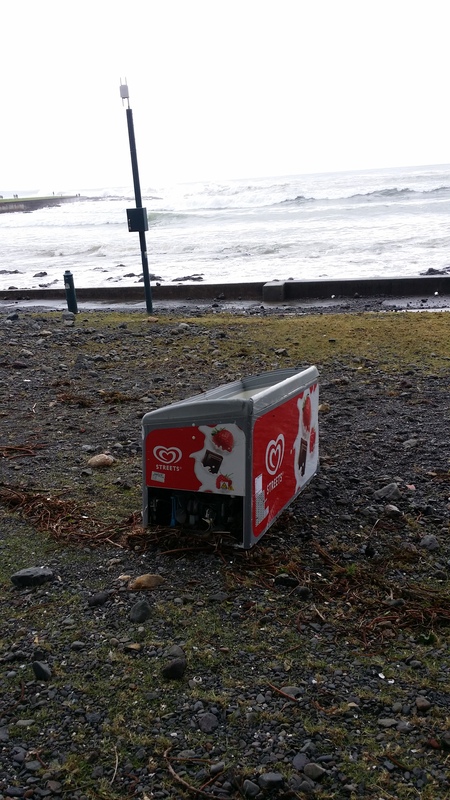 While the area has been tidied up, the damage done to the pathway and electrical infrastructure on the Black Beach promenade will take another six to eight weeks to complete, according to Kiama Council’s Director of Engineering and Works, Gino Belsito. “We’ve cleaned the site off and barricaded it,” he explains. “Now we have to stablise the edge and then re-lay the electrics and the concrete pathways. Apart from lighting, the electricity is needed for various markets and events held in the area. 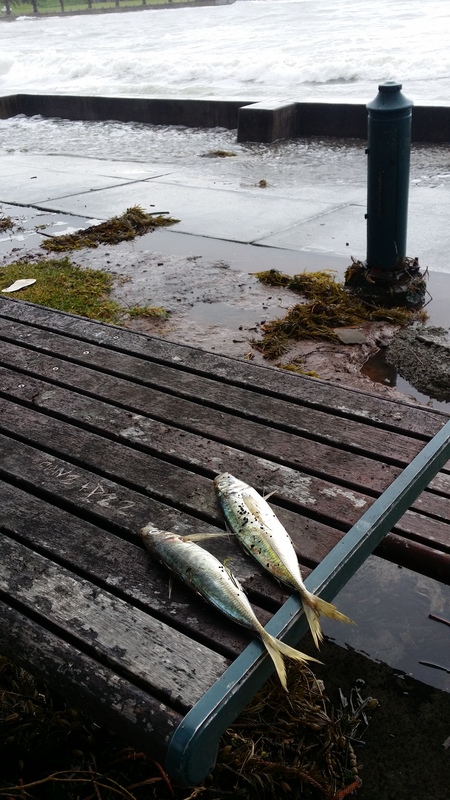 The only other significant damage in the LGA is the need to replace two piers of the new jetty near the harbour boat ramp. The four sea pools are also closed pending assessment, for as yet the water has been too murky to check for debris. There are concerns that Kiama rock pool may have been undermined. If no structural damage is found once the pools are drained and cleaned, all of the pools are all expected to be open again by the end of June. The work will be paid for by the State Government’s Disaster Relief Fund which provides for remediation of storm damage in proclaimed disaster areas. Mr Belsito says that compared to other nearby areas Kiama got off quite lightly. The strong seas created by the East Coast low at the beginning of July have caused significant beach erosion, particularly at Kendalls Beach where the rocks have come out of hiding. 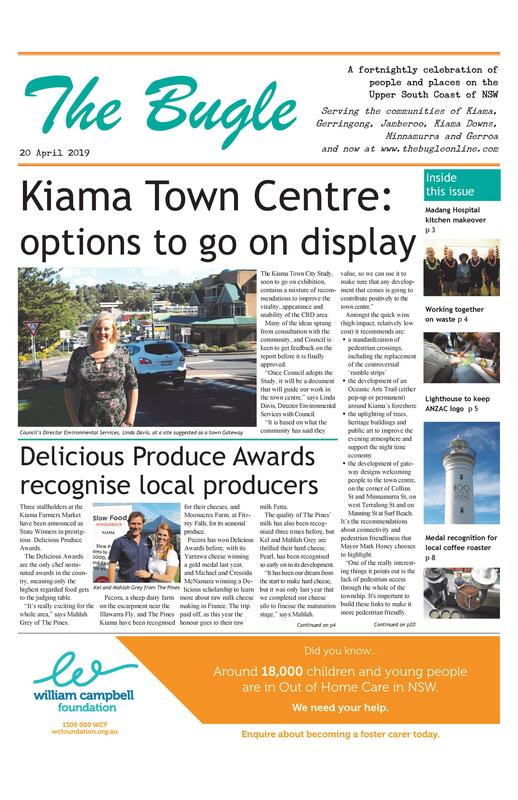 The weekly Kiama Farmers’ Market has relocated to at Surf Beach while the repairs are made.